Situated in High Peak, this inn is within 6 mi (10 km) of Etherow Country Park, Lyme Park, and Stockport Golf Club. Hat Works Museum of Hatting and Adlington Hall are also within 12 mi (20 km). New Mills Central Station is 22 minutes by foot. Situated in High Peak, this guesthouse is 2.1 mi (3.4 km) from Chestnut Centre Otter, Owl and Wildlife Park and within 9 mi (15 km) of Peak Practice Golf Driving Range and Millennium Walkway. The Crescent and St Ann's Well are also within 9 mi (15 km). Chapel-en-le-Frith Station is 22 minutes by foot. Situated in High Peak, this inn is 2.8 mi (4.5 km) from Chestnut Centre Otter, Owl and Wildlife Park and within 6 mi (10 km) of Millennium Walkway and High Lea Park. New Mills Golf Club and Peak Practice Golf Driving Range are also within 6 mi (10 km). High Peak Chinley Station is 12 minutes by foot. Situated in High Peak, this inn is 1.5 mi (2.4 km) from Chestnut Centre Otter, Owl and Wildlife Park and within 9 mi (15 km) of Peak Practice Golf Driving Range and The Crescent. St Ann's Well and Buxton Museum and Art Gallery are also within 9 mi (15 km). Chapel-en-le-Frith Station is 21 minutes by foot. How Much is a Hotel Room in High Peak? Hotels in High Peak start at $48 per night. Prices and availability subject to change. Additional terms may apply. High Peak features a wonderful selection of Travelocity-listed places to rest and relax. Travelocity users can book approximately 13 excellent accommodations within a short drive of of High Peak. The Old Hall Inn is amongst the most ideally situated options, one of just a small number of options within an easy stroll of the High Peak city center. 17 miles (28 kilometers) from the center of High Peak, you will come across the Durker Roods Hotel. Alternatively, the White Hart is located about 14 miles (22 kilometers) away. The Waggon Inn and also the Carriage House are two alternative accommodation options worth checking out around High Peak. 6 miles (10 kilometers) away from High Peak, you can reach Buxton, which is where you can spend a few hours exploring The Crescent, Buxton Opera House and Pavilion Gardens. The Palace Hotel and Old Hall Hotel are a few of the Travelocity-listed accommodation choices in Buxton. 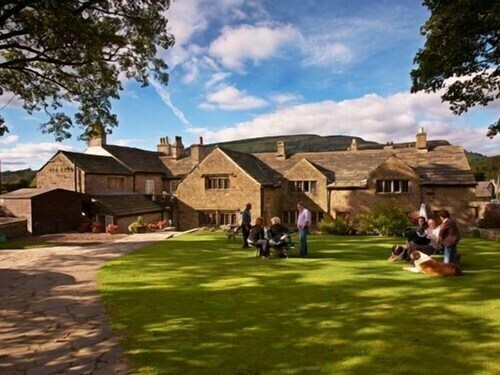 9 miles (15 kilometers) to the east of High Peak, is [name of second nearby city or town (sibling)], which features the Stoney Ridge and YHA Castleton Losehill Hall - Hostel. During your time in [name of second nearby city or town (sibling)], don't miss the Peveril Castle, Peak Cavern and Speedwell Cavern. Discover Derby, 35 miles (57 kilometers) from High Peak. While you are exploring the region, plan to check out the University of Derby, Westfield Centre and Royal Derby Hospital. The Derby Cathedral and Derby Museum and Art Gallery are also well worth checking out. Aston Court Hotel and Breadsall Priory Marriott Hotel & Country Club are all great Travelocity-accredited accommodation options in Derby. Simply because you and your family are on a break, does not mean that you can't feed your obsession for sports. You can find Villa Park 60 miles (94 kilometers) to the south of High Peak. Travelocity customers that like the convenience of booking accommodation close to the game, book a room in the Britannia Hotel Birmingham or Hyatt Regency Birmingham. Manchester Airport is the most used entry point for those arriving in High Peak. It is 13 miles (21 kilometers) from downtown. For modern travelers who have plans to find a base nearby, book a room at Radisson Blu Hotel Manchester, Airport or Britannia Hotel Manchester Airport. 5.0 Great place even better owners. Owner is a hoot, very friendly and accommodating. Breakfast is the real deal and with what had to be the best view of kinder from the large windows. The road can be busy if you have a room on that side but quietens down later on in the evening. If I were to stay in peak district again I would not bother looking for another place. A short walk to the town of Hayfield is perfect if you don't want to drive for either hitting the trails up to kinder or grabbing a bite.